These days, it seems that the Internet is overrun with blogs. Everyone is blogging – moms blog, doctors blog, dogs blog, Jaffe blogs. Experts on every topic under the sun are taking to the web to tout their knowledge. With all that content out there, you may think you’re too late to the legal blogging scene. After all, why bother when it will just get lost in that sea of too much information? Well, guess what? Blogging is good for your law firm, and good for you. 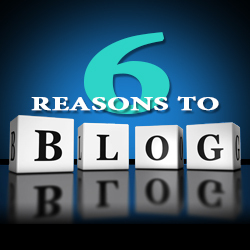 Here are six reasons why you should start blogging now. Writing a blog with keyword optimization in mind can result in your firm’s website appearing higher in search engine results for the keywords you target. Google’s search algorithms reward websites that produce unique quality content with a higher rank in search engine results. Statistics show that companies that blog frequently each month get five times more website traffic than companies that don’t. Personal branding is the practice of people marketing themselves and their careers as brands. Your personal brand is all about who you are and how you want to be perceived. Blogging allows you to show the public your personality, your perspectives and your identity. It gives your audience, and potential clients, an in-depth way to get to know you in much greater detail than your bio page ever will. To build your reputation as a leader in your area of practice, you must be regularly visible in your field, and share your knowledge with others. Blogging gives you a forum to demonstrate your expertise and become the “go-to” person on a specific subject, which builds your professional credibility, which attracts new clients. More and more, potential clients are turning to the web to find legal help. Blogging allows you to create targeted content that will attract prospects to your website. Reading your blog gives them a sense of who you are, along with your areas of experience. It also goes a long way toward convincing them that you are the person to hire for their situation. In fact, statistics on blogging prove this point: Companies with active blogs report 97 percent more leads. Establishing yourself as an authority in your field will not only increase your book of clients, it also will open doors to opportunities such as speaking engagements, guest blogging offers and media requests. Let’s face it: If you don’t fill the niche, another lawyer will. Even so, you can distinguish yourself from the crowd through your blog. Use your voice, be authentic and promote your brand. Be consistent, illustrate your knowledge and publish often. Only by jumping into the blogging fray can you begin to reap the benefits outlined above and outperform your competitors. The benefits of legal blogging shouldn’t be ignored. When you consistently put quality content out there, your posts become their own marketing machine – friends, clients and colleagues can share them through social media, instantly introducing you to a whole new group of people. The rewards are too good to pass up, so get blogging now! Already blogging? Contact me, Jennifer Faivre, at jfaivre@jaffepr.com, and tell me what other benefits you have seen from your efforts.